National Society of Film Critics, Reykjavik International Film Festival: Best Film; Cannes Film Festival: CICAE Award, Chloé Zhao; National Board of Review: Top Ten Independent Films; 18 other wins, 41 other nominations. 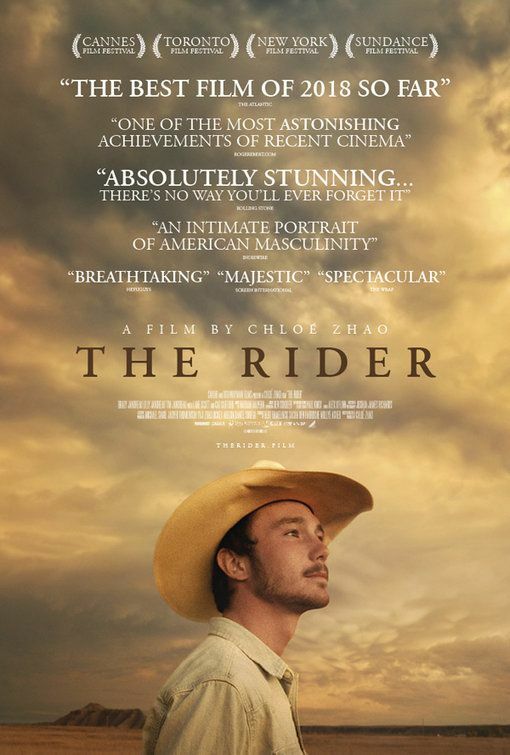 With a film that rides an invisible line between drama and documentary, Beijing-born director Chloé Zhao opens up a new frontier for our romance with the cowboy in “The Rider.” Real-life wrangler Brady Jadreau stars in a version of his own true story, as a rodeo champion who is thrown out of work by a near-fatal head injury. In fact, the film’s entire cast play versions of themselves, with only their last names changed. Their collective performances are authentic and unforced, thanks to director’s Zhao’s artistry. This is a movie that is literally about getting back on the horse. But in Brady’s case, that proves to be a dangerously dubious option, so he settles for a job in a supermarket, then finds work as a horse trainer—while caring for his mentally challenged teenage sister, feuding with a father who has a gambling problem, and cheering on a quadriplegic buddy paralyzed by a bull-riding accident. Still, the rodeo siren beckons Brady and the urge to tempt fate is strong. As grim as all that may sound, “The Rider” is a thing of exquisite beauty. It’s strangely rewarding to watch a movie with two winning characters who are mentally challenged. The real-time sequences of Brady coaxing trust from unbroken horses cast an extraordinary spell. And between the rhapsodic landscapes courtesy of exquisite cinematography by Joshua James Richards and the spare dialogue, Zhao grounds the Zen-like myth of cowboy culture in a rare authenticity.